An unusual and incredibly educational museum! An unusual and incredibly educational museum, a sumptuous temple to Neoclassical art and the art of living in the First Empire, with countless evocative reminders of the Napoleonic era. Its prestigious collection of exotic clocks (1795-1815) is one of the largest in the world and includes some really exceptional pieces including the stunning “Paul et Virginie” clock by the bronzemaker Thomire, commissioned by Bonaparte himself in 1802. The theme of the “noble savage”, nurtured by Defoe (Robinson Crusoe), Bernardin de St-Pierre (Paul et Virginie) and Chateaubriand (Atala) is explored in a magnificent collection, which is well worth a visit. 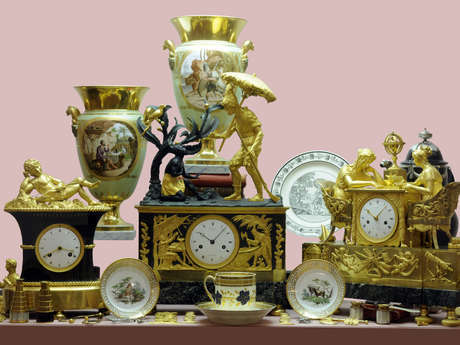 The museum also includes a remarkable collection of porcelain pieces by the best manufacturers from Paris and Brussels, as well as exquisite gold work, exceptional gilded bronze pieces, antique jewellery (including some stunning cameos) and an array of incredibly rare and fascinating objects. An exceptional museum of unrivalled sophistication. Housed in a listed late 19th century building, formerly the Banque Nationale de Belgique, the François Duesberg Museum is undeniably one of Belgium’s finest. An incredible marriage of the art of timekeeping and the art of entertaining! A testimony to Baron and Baroness François Duesberg, the museum is based on a private collection lovingly gathered throughout the long lives of meticulous and passionate collectors; a remarkable feat. Thanks to the generosity of Mr and Mrs Elie François Duesberg, the City of Mons has been given the opportunity to house an internationally renowned collection dedicated to Neoclassic Art from 1775-1825 in the town centre. Guided tours available on request – please contact the Curator, Baron François Duesberg. Guided tours can be booked in advance through the general curator of the site, Baron François Duesberg.